So far Master Clean USA has created 36 blog entries. We were so impressed by the service we received, we would like to extend super compliments to the cleaning staff. The attention to detail, was impressive. I will gladly use this service again. Thank you. The service was excellent. They took care of the cleaning while I was at work. Excellent and talented crew members taking care of what I do not need to worry about. I’d like you to know that I and the radio technicians are extremely pleased with the high quality of work that your crew performed in our warehouse. This and the swift response to our needs has put your company at the top of our list for future cleaning projects. I was extremely please with Jessica and Master Clean USA. Jessica made the scheduling painless and the quality was amazing the place not only looked good and clean it smelled good! The past tenant was a smoker and I knew it would be a challenge to remove the smell. A Big thank you to Jessica and her team, I will use them again and again! I was so pleased. I just hope my landlord is equally pleased and gives me back my whole deposit. If she doesn’t, it won’t be because of the job you did. Jessica and her crew totally came to my rescue. Jessica and her crew totally came to my rescue. I needed an apartment cleaned that was in the worst shape imaginable and I needed it done within just a few days. Jessica scrambled to make arrangements so that my deadline could be met. Her crew did an amazing job cleaning the apartment and shampooing the carpet. Such a HUGE difference! Truly above and beyond service! Thank you SO much!! We offer a variety of cleaning services from move-out, to spring cleaning and construction clean-ups, but we also specialize in specific services such as stone restoration. With granite, marble, travertine and limestone as popular counter tops and floors in many homes, hotels and restaurants, we have created a green technique to revitalize and bring out the ‘shine’ in natural stone. In addition, we are a Dry Treat accredited applicator and can clean and seal pool coping, patios as well as balconies, decks and much more. Our partnership with Dry Treat means that the client can receive a 5-15 year warranty against water and oil for their natural stone. 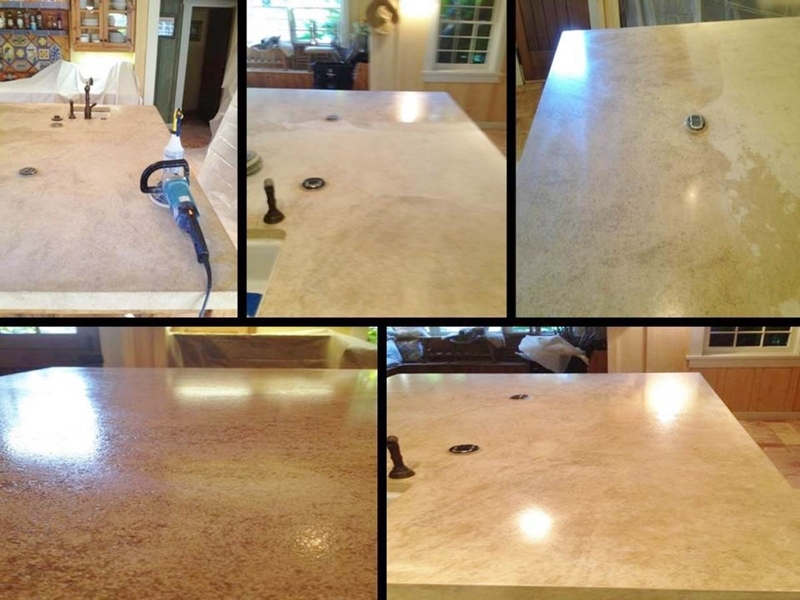 Here is a quick run-down of our stone polishing service and some before, during and after pictures. What: Dimension stone is a natural stone or rock that has been harvested and fabricated for specific construction and/or building purposes such as flooring, counter top slabs, tile, vanity tops (examples: granite, marble, travertine, limestone). Why: The appearance of stone surfaces diminishes over time through normal use, whether that be stone tile flooring, kitchen counter tops or bathroom vanities despite adhering to a cleaning regimen that conforms to the specific stone and/or use of proper sealers. How: Master Clean USA’s procedure for re-honing or re-polishing is a completely green process employing tools and specific polishing pads which are minimally disruptive, use only water, and provides a final product which restores the surface of the stone to its originally intended luster. Our stone restoration services’ expertise and reputation became so sought after that in 2015 we opened a stand alone division of the company to facilitate the stone restoration customer finding us. We got much input from clients that they never would have guessed a cleaning service would provide such a service so we opened Santa Barbara Stone Masters. If you are interested in learning more about our stone restoration services, see our testimonials or before and after pictures, please see its stand alone site, or to schedule an appointment, click and fill out our proposal form and we will get right back to you!